The Nintendo Web Framework has opened the floodgates for indie developers on the Wii U, and while the HTML5-based system is flexible and user-friendly, the games that have been released so far have been mediocre at best and atrocious at worst - until now. 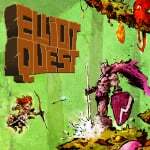 Ansimuz Games and PlayEveryWare's Elliot Quest, created with the Impact engine, is not only leagues ahead of most other HTML5 games in the eShop, but also a great game in its own right. With great attention to detail and highly polished gameplay, Elliot Quest is the latest gem in the Wii U eShop. The 8-bit-style Elliot Quest is heavily inspired by classic NES games such as Zelda II: The Adventure of Link. A side-scrolling action/adventure with RPG elements, players control Elliot, a young boy on a mysterious quest that becomes clearer as the game progresses. The story is surprisingly strong and nuanced, bringing to mind titles like Shovel Knight, whose cute and colourful aesthetic hides a complex, poignant tale. The retro inspiration shows from the beginning, as players are dropped right into the game without instruction or context. In the beginning, Elliot can run, jump, and shoot arrows, limiting where he can traverse and what he can do. 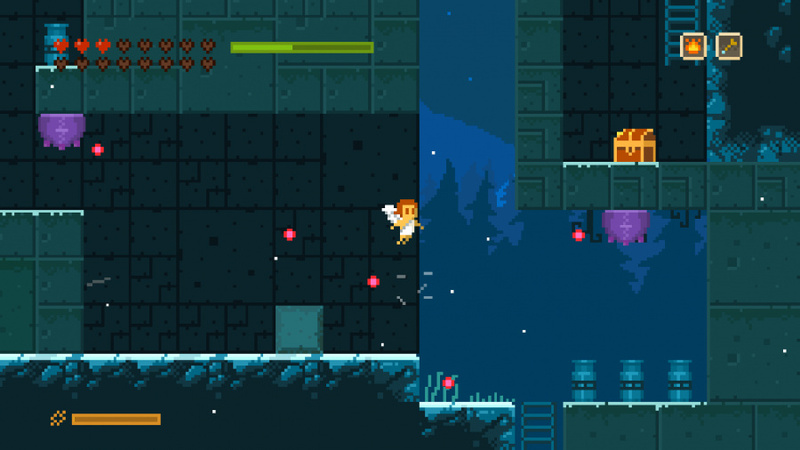 In classic “Metroidvania" style, Elliot will gain many items throughout the adventure that give him useful and powerful abilities. Acquiring the item that allows Elliot to double-jump is a satisfying and freeing moment, and that sense of accomplishment occurs every time a new power or item is acquired. Some items give automatic abilities, like the double-jump or the ability to jump on enemies Shovel Knight-style, while others have to be equipped. It's easy to get lost in Elliot Quest. The top-down overworld (much like Zelda II) has several caves, mountains, forests and beaches to explore, and there's no indication as to where to go next. There are five dungeons to conquer, each packed with puzzles similar to the ones found in Zelda games, as well bosses at the end. Following each boss battle, Elliot gets a new magic item to equip, such as the ability to turn into a small tornado or shoot fireballs. All of these are useful in combat, which is a good thing as battles can be very challenging. A simple RPG system is also in place. Killing enemies will give Elliot experience points, and levelling up grants points to go towards attributes like strength, defence and more. Dying in Elliot Quest actually has consequences. While Elliot will simply respawn at the last checkpoint (which actually has a clever narrative purpose), a moderate amount of experience will be lost. The visuals in Elliot Quest are charming and colourful. The game runs smoothly for the most part, but we did encounter some slowdown during moments when there was a lot happening on-screen (you could argue this is in-keeping with the humble hardware this title is attempting to replicate). The retro music is catchy, and the sound effects are appropriately 8-bit. The GamePad is used an inventory display, and there's also off-TV play. Elliot Quest can be played through in 6 to 9 hours depending on how lost you get, and there are several secrets to discover which naturally extend that total play time. Elliot Quest is a solid new entry to the ever-growing stable of great eShop titles. While it's not perfect - there really shouldn't be slowdown in a game with 8-bit pixel art, and it can be frustrating to try to figure out where to go next - anyone looking for a challenging, satisfying action adventure will likely get a lot of enjoyment out of it. 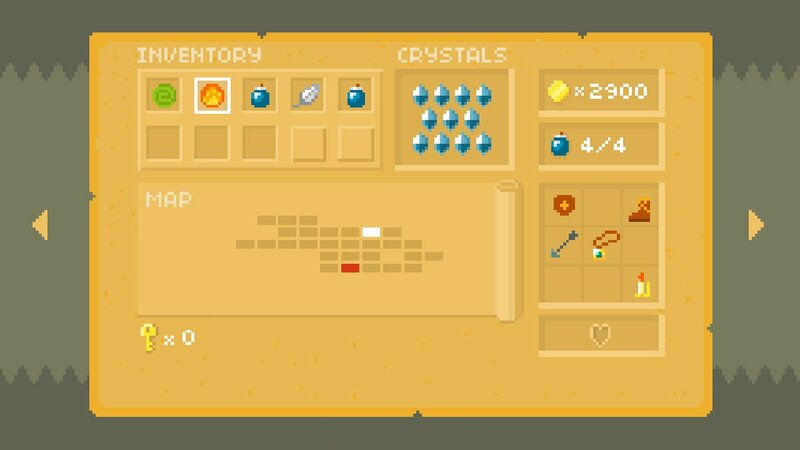 As well as all this, Elliot Quest is a great showcase for what HTML5 can do. Just be prepared to do a lot of exploring. The slowdown is definitely odd for a pixel art game. Fun game, though. This is such a lovely game. I intended to try and play through the entire thing this past weekend, but I was barely able to stop at home. Will keep doing it through this week. If this was on the 3ds I would've already dl'ed it. I just don't game on my Wii U much these days. Brief review,took me back to the Wii Ware World days. Great game. The only thing I don't like is the obvious bug where you can be taken to an area that requires a double jump and you can get trapped. I really thought that would be part of the patch. I'm past that point anyway and everything else has been great. Just keep a feather once you can buy one until you get the double jump. I am surprised the review didn't mention that the game is full of Nintendo easter eggs and shout outs. There are NPCs and even the music in the first area is obviously a homage to the legend of Zelda. As for this - do people really like the 8 bit graphics in this and Shovel Knight? I'm aware not every game needs to be photo realistic like Call of Duty, but I've played plenty of indie games that actually look great - Rainbow Moon, Toki Tori 2+, Paper Monsters Recut, Trine - why do I want to look at pixels in 2015? This looks great, what is the slowdown issue, frame rate or something? @Captain_Gonru - "what was the issue with your external HDD"
Not the HDD per say - that's a whole other issue as the enclosure burned out, smoke and everything, when I say it burned out I mean it really burned out, and I had to buy a new enclosure - but copying and moving save files to and from the HDD. My son played HW while the HDD was waiting for a new enclosure, I and my other son didn't. We each have our own NNID and profile on the Wii U (as does my wife but she isn't a gamer, it's more there out of politeness) so when the HDD was hooked back up it had 3 profile saves on it, mine, my youngest son, and my oldest son. Since the Wii U automatically plays off of the external HDD when it's attached and turned on when my oldst son went to play he had his old save file. So, I went into settings, found HIS save file on the internal and copied it over to the HDD. And in doing so it erased my and my other sons save file. Even though we each have our own profiles the system keeps everything w/ the game, so move even 1 save from internal to external or vice versa adn it overwrites EVERYTHING else related to that game. And that's just stupid. I's also stupid that you can't back up a save file to an USB thumbdirve either unless you copy the ENTIRE game download. It's ok w/ disc games as the game is on the disc, but any download game, retail or indie, and you can only back up the save w/ the entire game, not just the save. Not as stupid as SSBU, which only uses 1 save file across all profiles as if profiles don't even exist or matter at all, but that has nothing to do w/ the external HDD. I haven't even played SSBU b/c when I first went on all fighters had been unlocked from my sons playing. If you don't beleive me set up a new profile, call it "TEST" or something, and go start a new game of SSBU. All the progress form your other profile will be there. So so SO stupid. @rjejr Didn't burn out on it just haven't taken the proper time with it. As for games like Shovel Knight, I for one ain't the biggest 2d side stroller fan nor a fan of graphics of the old school but there's just something special about SK that needs to be played by all fans of gaming in general. As for this, it looks enjoyable as well. Maybe not on the level of SK but a good game is a good game Reguardless of graphics. I've never cared for graphics over gameplay anyways. Maybe it's because I grew up with pixel graphics but I find a game like this really goes better with them. Not that I don't like the look of other styles. Same with shovel knight. If there is another new 2D megaman I would rather that use the excellent model from Smash Bros and not be pixels like 9 and 10. I happened to win a free code for this on Twitter, and it's amazing. Very well-made game despite all the exploring needed to figure out where to go next. I won't buy anything new for awhile (unless MMBN3 or Zero 2 comes out in NA or we get a surprise during a Direct or or or) but I guess this should be on the top of my list. I still have to finish up Hyrule Warriors though! Three maps down, and the Majora one is coming along nicely. Then Xenoblade will release, and once again I'll be consumed. I've been enjoying this game so far. Though I think it would work better, or sell better, as a 3DS title. "also stupid that you can't back up a save file to an USB thumbdirve either unless you copy the ENTIRE game download." This. I wanted to have a backup of each save file in the Wii U when I transferred the games to the HDD, or just transfer the game but not the save file. Or your other complain that you cannot choose where to download, as the HDD is prioritized in the eShop. Even game updates go to the HDD. Regarding this game, not sure that I will get it. I would rather get Ittle Dew first. @Spoony_Tech - "I've never cared for graphics over gameplay anyways." I don't need graphics over gameplay - The Bouncer on PS2 was 20 minutes worth of nothing - I guess I just don't see the appeal of playing games that look like they were made in the 90's when I don't have to. Games weren't made to look like that on the NES and SNES b/c there is anything great about the look, they look like that b/c that's as much as those systems were capable of handling. I just feel like I don't deserve anything less than what my current systems are capable of handling. Were people who owned NES and SNES clamoring for games that consisted of only green phosphorous dots? @Captain_Gonru - I'm pretty sure 99% of people don't have a problem w/ their external HDD, I just like more control over my hardware. Well maybe 98%, @sinalefa seems to agree w/ me on this one. The lack of direction and communication in this game seriously bothers me, but outside of that, I love it. I just hate having to spend 30 minutes to an hour without a hint of where I need to be headed when there are tons options on the map. I'll definitely be picking this up at some point! I knew it was going to be good as soon as the first trailer started playing! This game is truly old school. There is no hand holding here, with the exception of the save feature. The game makes me think of a terribly hard game called battle of Olympus. That game had a seriously long password to put in and heaven help you if your Us looked like Vs or your Os looked liked 0. Games today have evolved, evoking nastalga is not that easy and Elliot's Quest does this. It has all the right parts in all the right places. There is room for improvement in this game, but I am fine with it just the same. Get this game if you like Kidicarus, Zelda 2, Battle of Olympus, Faxandu, or any game similar. If exploring/getting lost is considered one of the game's only real downsides, it sounds like a real gem IMO. Nice review and nice score! I might wait for a discount, but I certainly download it someday. Is this any different from the PC version? @rjejr I don't like the 20 year old graphics of this game or shovel knight. I would love it if they looked like 10 year old pixels, but I do enjoy the games in spite of their appearances. Move over Shovel Knight, the retro genre has a new king. All hail Elliot Quest. Great game. @Captain_Gonru - "like a hipster thing or something"
Personally I really just don't like playing games w/ graphics like this, but I do feel there is some truth to the hipster thing. I'll let you read my "Nostalgia is History" anti-hipster credo I wrote in the 90's some day. I grew up with 8 bit games, so I have a soft spot for these kind of graphics and music. But I don´t like many of the old games. Due to their lack of save points many are too difficult and frustrating. The other thing is, there are no hardware or file size limitations in a modern "pixelgame". Anything is possible and much more surprising. I also prefer modern 8-bit games over new Virtual Console releases. I love to play retro-looking games on Wii U and find them more appealing than original NES/Atari games nowadays. And I played hundreds. I'll be picking this up pretty soon. Love how it's like Kid Icarus and Zelda II. Art that trends towards abstraction or simplification causes the viewer to fill in the missing information with our own imaginations or experience. 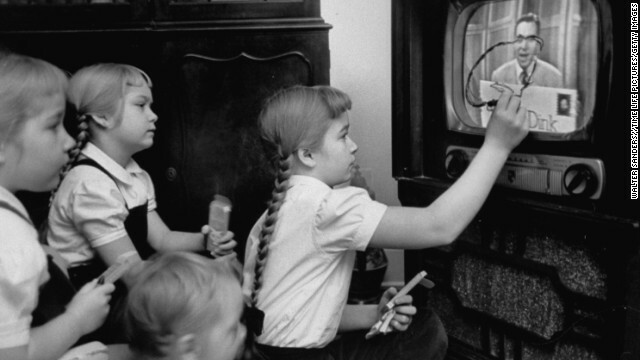 It can create a personal bond with what we are viewing. Pixel art has become a popular form of abstraction even beyond video games and thanks to Minecraft it has a new flavor that kids are going to appreciate far into the future. Not all of it has the best qualities of suggestion and not all of it is even pleasing to the eye, of course. It can be efficient for indies to use compared to detailed imagery which takes longer to create, but good pixel art takes time, too. So, while I think it has been a draw for some artists due to their nostalgic feelings towards early video games, people have discovered it can be great in its own right. @aaronsullivan - My wife HATES the look of Minecraft, she can't even look at the screen if it's on. And it is ugly, but I figure thats the price we pay for such a malleable world. 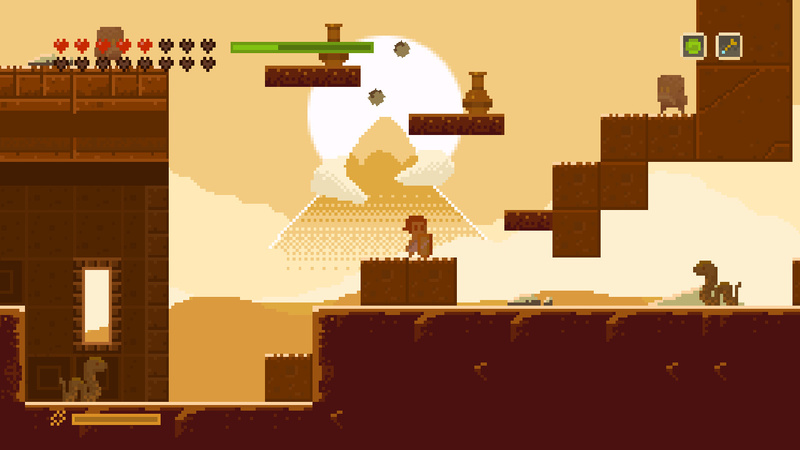 A 2D simplistic platformer can at least offer up the ability to round out the edgies. I don't mind simple art and colors, I loved Colorforms growing up and Winky Dink as a child, I just don't like pixels. Well, wouldn't even try to change your mind, it's obviously a subjective thing. I will say that Minecraft's choice of style isn't just a price to pay, it serves the purpose of helping the entire game work for people. You smash a large rock with a pick axe a few times and now you are carrying it's entire mass around. You can carry what would be literal tons of mass and place it willy-nilly and yet people still feel it to be a transportive experience. The entire game has a deep level of abstraction and the pixel art is just an extension of that to actually help people accept the alternate reality. It's a good case to study because of its immense popularity across all ages. Something is working there even if not for you and your wife. @aaronsullivan - I like Minecraft as long as I can use one of the skins. Even the Skyrim skin which doesn't change much gives it a sense of clearness the base game lacks. And the music is far superior. If it makes you feel any better I don't like the way 90% of games look, they are all too dark and black and brown. Does the sun ever come out in Gotham? 4 games and it hasn't stopped raining. I haven't got this yet, but considering how easy it is to get lost, is it as bad, or worse, than say, La-Mulana? @rjejr I think it's more of the style per se than the actual detail itself. I for one enjoy graphics like these, I also like 1080p detailed games. Pretty darn close to beating this game, i might be stretching this a bit too far but this is my favorite eshop game that came out this year so far until something else comes out. its also lot better than most of the HTML5 games that came out on Wii U as well. but i will say there are a few things i noticed when i played the other than the frame rate drops. 1.When you die sometimes you see your hearts extend all the way out the screen. 2.The larger enemies have attacks that are somewhat bugged ranging from four of five hearts of damage to killing you instantly. 3. There this Graveyard glitch I've been hearing about but i haven't en-counter it my myself. The developer said theres a fix on the way and hopefully these issues are addressed during the fix. Oh my god I love that splash art! It looks like something you'd see from an early issue of Nintendo Power! It sounds like fun, but this is one of the few games that tweaks the graphics snob buried deep inside. I can't get over that artstyle. I may have to watch a lets play or something to convince me. Ninty releasing another 3DS game on the WiiU...why do they keep doing this?! The graphics in this game really bugs me due to only using the pixel graphics as an aesthetic choice. The way the pixels actually differ in size to eachother, and how scrolling is smoother than the resolution actually allows because you can move a fraction of a pixel... No thanks. While the lack of handholding and feeling of relatively free adventuring is good, the difficulty is all over the place. Both Shovel Knight and La Mulana are far superior games in all regards. I played this recently in Nintendo World I was pretty impressed with this game but I found it a bit tricky, I will probably download this. I wish it was a bit cheaper though. Great game! The optional bosses are hard to find but worth it, totally worth it to beat them all. They're all really cool and probably better designed than the last boss depending on how you feel about the last boss fight (I feel that fight is more about style over substance, so not that satisfying to figure out and execute). A couple of the optional bosses feel like colossi from Shadow of the Colossus. @Spoony_Tech You got your wish, it is now available on the 3DS. @Amrulez and I'm definitely considering it now. Thanks for the heads up.